Are your kids picky eaters? Are you tired of cooking the same thing all the time? 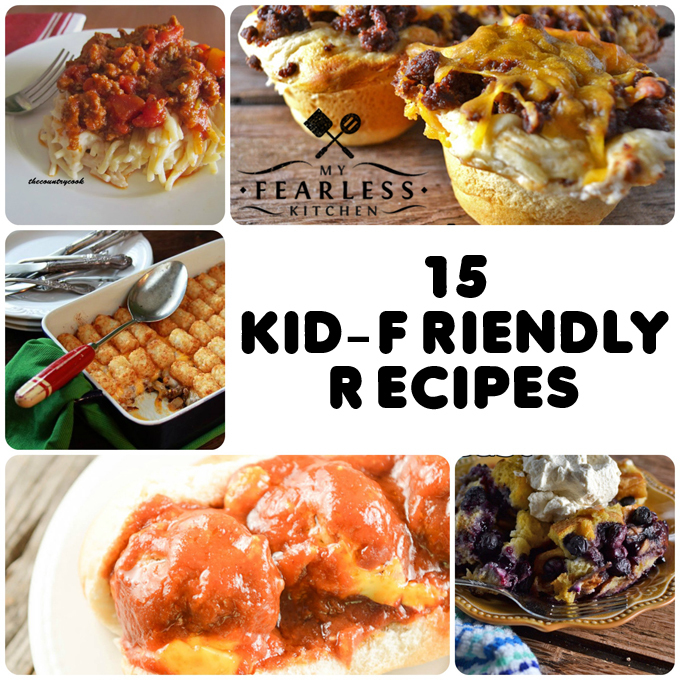 Find a new family favorite on this list of 15 Kid-Friendly Recipes to try! It’s not quite lasagna, it’s not quite spaghetti… This Baked Spaghetti (Spasagna!) from Brandie of The Country Cook looks delicious! Give every kid their own cheeseburger in a cup. Everything tastes better when you bake it in a muffin tin! Speaking of cheeseburgers… check out these Cheesy Stuffed Sloppy Joe Meatballs from Cris at Recipes That Crock! You’ll love making these in your slow cooker. No kids’ menu is complete without Mac & Cheese. Try your hand at a homemade cheese sauce – you’ll be glad you did! And you can never go wrong with tater tots… This Tater Tot Casserole from Stacey at Southern Bite looks delicious! Liz from Farmwife Cooks has a rainbow of options for you. Check out her Rainbow Dinner Project, and I know you’ll find something the whole family can enjoy. We are all looking for different ways to use ground beef. This Easy Sloppy Joe from Raquel at Organized Island is just what you need! Don’t forget about dessert! I can’t wait to try this Red, White, and Blue Sundae from Betsy at Desserts Required. Pizza anyone? This Grilled Pepperoni Bread is so much fun to make instead of pizza and breadsticks! If you thought those Cheeseburger Cups were a good idea, you’ll love these Mini Taco Pies from Kimmi’s Dairyland! This Slow Cooker Blueberry French Toast is always a hit for breakfast… or breakfast for dinner! You can never go wrong with a classic. This Hot Dog Casserole from Jeanette at Fencerow to Fencerow is sure to please even the most picky eaters. If you like soft pretzels, you’ll want to take a little time to make these Homemade Soft Pretzels. Your kids can help mix, twist, and salt them. What is your go-to meal for your kids? Which one of these will you try first? Or pin each individual recipe by clicking on the photos above. Is This Chicken Done? – free printable! What’s the Difference Between Ice Cream & Frozen Yogurt? These look amazing! Pinning! Thanks for including my casserole. Thanks so much for including my Red, White and Blue Ice Cream Sundaes. All 15 recipes look very tempting and SOOOOOOO kid-friendly. It was my pleasure! I can’t wait to dig into all of these recipes!